World-renowned multiple myeloma researcher and clinician Gareth Morgan, M.D., Ph.D., today was named director of the University of Arkansas for Medical Sciences (UAMS) Myeloma Institute for Research and Therapy (MIRT). A fictional scenario involving armed intruders entering a UAMS research building, then later detonating an explosive that spread possible radiation both tested preparedness of federal, state and local agencies in a large-scale exercise on campus April 22. 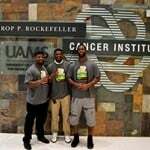 Defensive tackle for the Tampa Bay Buccaneers and Super Bowl XLVIII champion Clinton McDonald learned that he has something in common with UAMS Winthrop P. Rockefeller Cancer Institute patients when he paid them a visit last week — they are fighters.